What are the best Forex trading platforms? Full list of the winners is here! Best Bonus Forex Offers available at your fingertips! So, you have read up on FX trading. You probably spent hours scrolling through various articles on the internet. Some of the ones that you have read, praised the huge opportunities that the FX market allows traders to have. The other ones warned new traders to stay away from something they knew little about, but you are not scared. You are good at learning new things, and you have decided that trading FOREX is the next thing that you want to learn. You have already chosen a great broker, with excellent reviews, (thanks to the internet) but now you need to choose a trading platform. Now, however, you are completely lost. You don’t even know where to begin. If the former describes you in anyway, then this is the right place to start. Before anything else, first, you need to know what a trading platform is. So…What is a Trading Platform? In the most simple terms, a trading platform is software that a trader and his broker use to exchange information. The Forex trading platform allows the trader to have access to vital information like price quotes, and currency charts, and various indicators that traders can use to help make better trading decisions. The main purpose of the platform is to allow the trader to enter trading orders for the broker to fulfill. Without it, traders would have to call their brokers and personally tell them what trades they wanted to make because they wouldn’t be able to do it themselves. With this telephone method, quite a number of things can go wrong. The broker could make a mistake while entering the order. They could take too long to make a trade and then the trader is left with a bad entry. This could make the trader either gain less profit or take a larger loss. Telephone connections could go bad. Also, closing a trade at the right moment would be difficult as well. Using the telephone was the old way of executing trades, so when FX trading platforms were introduced, they made things much easier for traders. That being said, in terms of format, there are two main types of trading platforms, those that you download to your personal computer, and platforms that traders can access online. The online platform functions in the same way like the downloaded one. It allows the traders and brokers to interact in transactions together. It also shows price information that the trader needs to make his trading decisions. A Forex trading platform can also be grouped by the type of broker that uses it. There are two main types of brokers: brokers who use the Dealing Desk, and those who are Non-Dealing desk/ECN brokers. These trading platforms are supported by what we call Market Makers. Market Makers are brokers who take traders’ orders and process them directly by making a trade opposite to the one that the trader places. In simple words, they trade against you. If you place a buy, they will place a sell. If you place a sell, they will place a buy. If a trader uses a broker who is a market maker, when they place a trade they are not connecting with the wider FX market, but rather, with the broker’s dealing desk. This is where all the traders’ orders are sent to be executed. These trading platforms are used by brokers who use the ECN model. Unlike the Dealing Desk, price quotes do not come from the broker themselves, but straight from outside liquidity providers. All of these pricings are available to the trader so he can make the best choice for his trade. Lastly, there is third way to group Forex trading platforms, not just by format (ie. whether they are hosted online or downloaded onto a computer) or by what type of broker offers them. Trading platforms can also be grouped according to the programming language that they use. It is important to be aware of this, because a trader can have different experiences with each. This would affect the outcome of his trades. Currently, there are five different trading platforms that use five different programming languages. The MetaTrader platform both versions 4 and 5, were designed in the Metaquotes language by Metaquotes Inc. MetaTrader 4 (MT4) is easily the most popular trading platform that traders use. It is a rare thing for a broker not to use this product in the services that they offer. Traders who use MetaTrader consistently praise the software for being user friendly and having a simple layout that makes it easy to use. If a new trader wants to go with what’s popular, then this is the place to start. This platform is a type of ECN or electronic communications network that allows traders to have direct access to the forex market. In an ECN environment, the trader places an order, and instead of it being filled by the broker, the order is sent directly to those companies that provide the brokers with liquidity and they fill the orders themselves. The platform software was created by Spot Systems ltd, and is suited to those traders who want to use brokers who give them direct access to the market, and do not trade against them in order to process their trades. Most brokers who use the cTrader platform only allow traders to open accounts with a minimum of $1000. Traders should expect to pay a commission on every trade that they make, which is typical when using the ECN system. The platform is not as user friendly as MetaTrader and some traders find it difficult to add or remove indicators from their trading charts. This FX platform is made by ActForex Ltd, and has versions that the trader can either use online, or download to his computer. The layout of the platform is different to MetaTrader4 and 5, but it has become the second most popular platform used by traders. ActTrader isn’t just limited to trading Forex. It can also be used to trade other financial instruments like Options, CFDs, ETFs and others. 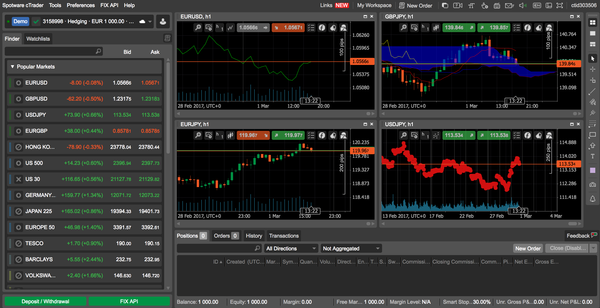 Is also has a simple layout and is user-friendly, like MetaTrader. This platform comes in two versions. The first is Currenex Classic which is used by typical ‘market-maker’ brokers, and the second is the Currenex Viking platform that is used by brokers that support ECN trading. The Currenex platform is not very user-friendly and beginners may have a hard time using it. Because of this it is mostly used by professionals. Traders may also find that the Classic model is more simple to use than the Viking platform. This particular Forex trading platform was written in the Lua programming language and was developed by TradeStation Technologies Inc. It is mainly used by two brokers, InterbankFX and Forex Capital Markets Ltd. At one point it was not available to retail traders, but was only used by institutions and brokers. Now, the ordinary trader can have access to a trading platforms that meets the professional standard. The main drawback with using this platform though, is that a trader can only use it on a desktop computer. So now you know the different types of Forex platforms. You are aware of how they are grouped, but with so many to choose from, you may be asking,..Which one of them is the best? The answer to that is one that only you can determine. As a trader it is very important that you do your research before making any decision towards trading. This includes researching which broker would be the best to suit your needs. Last, but not least, if you are someone who is on the go a lot, then you will need a platform that is supported across multiple devices. You will need a platform that you can use on your phone, your ipad, or your tablet. Many brokers carry platforms that support this, and if you have a very flexible lifestyle then this may also be an important part of choosing the right Forex trading platform. If you keep all of these in mind, then you will definitely make the right choice for your trading needs.